"This report, authored by two of our country’s leading experts on social integration, uncovers a picture that is more segregated by ethnicity than many of us have cared to admit." 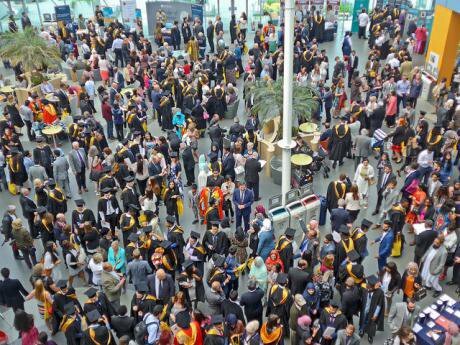 Graduation day at Bradford University, July 2016. Flickr/Tim Green. Some rights reserved.During a year in which our country has seemed more divided than at any point in modern history, there are few questions which require investigation more urgently than the matter of how well we are living together. Equally, however – at a time in which our political debate has become yet more polarised and media headlines yet more fraught – there are few questions which it can seem harder to get to the bottom of. Too often, it seems as if our national debate on immigration and diversity is hopelessly, irreconcilably divided. Split between one group of voices claiming that Britain is full and that it’s time to shut our borders, and another insisting that it’s only a fundamentally backwards and prejudiced minority who believe that immigration poses any sort of risk to community cohesion. That’s why this report, authored by two of our country’s leading experts on social integration, is so important. Cutting through all the noise and the intense disagreement which has previously characterised the academic debate on patterns of residential segregation, Professors Cantle and Kaufmann have produced a forensic and fascinating insight into the reality of our national experience of diversity. They have uncovered a picture of a country that is in some ways struggling with the pace of change in its communities, and which is more segregated by ethnicity than many of us have cared to admit to ourselves. In rural parts of the country, minority ethnic communities have increasingly moved into previously all-white British towns and villages, but have remained ‘pocketed’ within ethnic silos. Meanwhile, whilst individuals and families of different minority ethnicities are increasingly living alongside each other in the same sections of our cities – boosting integration levels – white British people appear to be avoiding these same areas. This trend is resulting in communities which are at once hyper-diverse but increasingly segregated from the white majority. It’s clear that, whilst the UK is becoming increasingly diverse, levels of integration are not keeping pace. This has real implications for community cohesion – with social segregation having been shown to undermine trust between neighbours, to grow the fear of crime and bolster the prejudice which fuels the politics of recrimination and blame. This report also lays bare the striking pace of change in some of our communities – with many hyper-diverse urban areas experiencing a decrease in the white British proportion of the local population of over fifty per cent within a single decade (from 2001 to 2011.) This too has clear consequences for policymakers and community leaders seeking to promote bonds of neighbourliness and trust at a time of great social upheaval and change. In this context, it is clear we cannot carry on with a laissez-faire approach to integration in our country. Integration is a two way street and all parts of society have a role to play in preventing the UK becoming more fragmented. If we fail to do so, we risk sleep walking into a situation where the divisions exposed during the EU referendum campaign become deeper as we grapple with the challenges thrown up by globalisation. As the authors themselves acknowledge, though, there is cause for optimism here. We must learn from and build on the positive elements of the trends identified in this report as we turn to the vital task of developing a new and proactive agenda for the promotion of social integration. Indeed, I believe that this analysis represents an important contribution to the ongoing debate on how we can develop new policies and solutions to bridge the ethnic and social divides in our communities, and ensure that the UK reaps the full benefits of its intensifying diversity. I very much welcome this thought-provoking and timely report which will inform the work of the All Party Parliamentary Group on Social Integration, in particular our ongoing inquiry into immigration.